Switch your loafers for Gucci's chic slipper versions this spring. They're crafted from smooth black leather and are a versatile option for the office or evenings out. This almond-toe pair is adorned with the house's iconic horsebit plaque. Gucci - Gucci's black leather Princetown loafers have been a coveted item since their debut for AW16 - one of a selection of styles Alessandro Michele has immortalised for the Italian house. The backless silhouette is set on a small stacked heel that offers a slight lift, then finished with the iconic antique gold-tone metal Horsebit strap across the vamp. Consider them as an anchor to anything from smart tailoring to a vibrant print skirt. Gucci's slippers are constructed of black smooth leather. A cross between a loafer and a mule, this coveted style is finished with the house's signature horse-bit detail. 0.50/15mm heel (approximately). Elongated apron toe. Tonal leather piping. Antiqued brasstone hardware. Slips on. Lined with leather. Heart inset at footbed. Leather sole. Available in Black. Made in Italy. This style runs small. When purchasing, we recommend ordering 1/2 size up. Gucci Women's Leather Slippers - Black Size 6.5 A great designer gift. Shop Gucci at Barneys New York. Gucci - Few accessories can boast the enduring charm of Gucci's signature loafers, which is why, almost 70 years later, they remain a cult style through and through. Adapted with a backless silhouette, the Princetown slippers are crafted from supple leather in Italy and are anchored with burnished horsebit hardware. A worthy wardrobe investment with truly timeless appeal. These Gucci Princetown mules stand out as stylish and fashionable must-haves. Inspired by the iconic Gucci loafer, these smooth leather shoes feature the trademark stirrup-shaped decoration on the tongue. These mules offer timeless charm and work just as well with a midi dress as with pleated tartan pants. 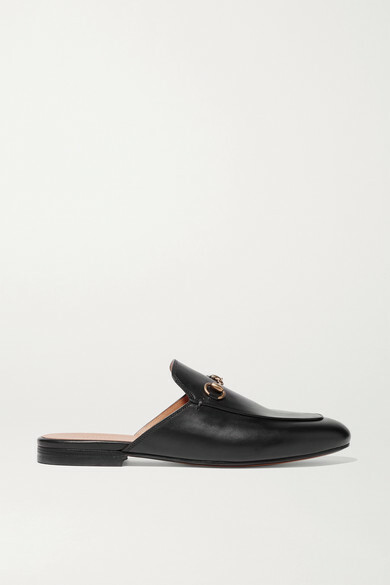 Gucci "Princetown" mule slipperreintroduced in classic, polished leather with symbolic Gucci horsebit.. 0.5" flat heel.. Rounded apron toe.. Golden horsebit detail.. Leather outsole.. Slip-on style.. Made in Italy. Gucci's Princetown slippers are constructed of black smooth leather. A cross between a loafer and a mule, this coveted style is finished with the house's signature horse-bit detail. 0.50"/15mm heel (approximately). Elongated apron toe. Tonal leather piping. Antiqued brasstone hardware. Slips on. Lined with leather. Heart inset at footbed. Leather sole. Available in Black. Made in Italy. This style runs small. When purchasing, we recommend ordering 1/2 size up. Gucci's slippers are constructed of black smooth leather. A cross between a loafer and a mule, this coveted style is finished with the house's signature horse-bit detail. 0.50"/15mm heel (approximately). Elongated apron toe. Tonal leather piping. Antiqued brasstone hardware. Slips on. Lined with leather. Heart inset at footbed. Leather sole. Available in Black. Made in Italy. This style runs small. When purchasing, we recommend ordering 1/2 size up. The Princetown slipper is reintroduced in our classic leather with our symbolic gold-tone Horsebit. Black leather. Women's. Horsebit detail. Leather sole. These shoes run small, we recommend sizing up half a size. Made in Italy.